What a year it’s been for Xbox. Microsoft had started the year trailing badly in the great Console Wars of this generation; while it was broadly accepted that the company’s recently-released Xbox One X was a superb bit of kit, its potential remained untapped as 2017 slipped into 2018. Meanwhile, the Xbox was in dire need of some worthy exclusives to rival Sony’s console. Much of Xbox’s hope was being pinned on a certain exclusive pirate title from Rare. But when Sea of Thieves released in March, it was to a mixed reception – something of a damp squib, to sound suitably piratical. While its ambition and style were to be applauded, players felt its seas were mostly empty, with no clear gameplay focus, and that more needed to be added to the game. The second big Xbox exclusive of the year arrived in May. State Of Decay 2 had another inauspicious launch, initially marred by a near game-breaking number of glitches. Once it was patched though, Undead Labs’ zombie survival game remains one of our favourite games of the year – although in terms of triple-A appeal, it lacked the clout of Sony’s Spider-Man PS4 and God of War exclusives… Microsoft still had a way to go. Then in June, Microsoft bossed E3, the industry’s big LA-based convention and a platform for the games companies to announce their plans for the coming year. Already, the accepted wisdom seemed to bear out Microsoft’s claims that ‘Games play better on Xbox’ – the Xbox One X, together with Microsoft’s Cloud tech, was beginning to realise its potential. 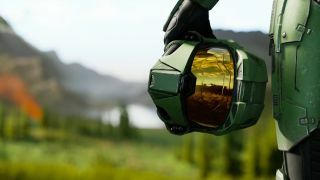 But Phil Spencer wasn’t going to let that stop him from teasing the next generation of Microsoft console, codename Xbox Project Scarlett, while an impressive teaser for Halo Infinite was a showstopper. Crucially, Microsoft announced the acquisition of four game studios – Undead Labs, Forza developers Playground Games, Compulsion Games and Ninja Theory – a move that suggested finally more Xbox exclusives were on the way. 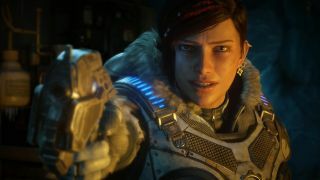 Still, much of the E3 excitement centred around the promise of games to come – like the elusive but fascinating Cyberpunk 2077 from CD Projekt Red, a new Gears 5 game for 2019 and a no-show for anticipated Xbox exclusive Crackdown 3. The big news of the year across all platforms was the phenomenal success of Fortnite and this was an opportunity for Microsoft to strengthen its ties with Nintendo by allowing crossplay with Switch, as well as PC and mobiles – leaving Sony out in the cold as everyone and their mums were playing Epic’s multiplayer. 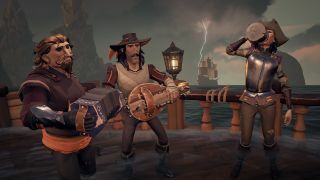 Throughout the year, Rare was busy improving the Sea of Thieves experience, with The Hungering Deep expansion bringing crews together to take down a giant shark. Forsaken Shores would follow later in the year, ensuring that Sea of Thieves still has plenty of sea-legs. Meanwhile, Microsoft had been busy making Xbox gaming accessible to all with the launch of its truly innovative and, crucially, affordable adaptive controller, meaning that less able-bodied players can play Xbox thanks to its wide range of add-ons and broad scope of adaptability. The company also continued to improve its subscription offerings too – Xbox Games with Gold has offered some great free games throughout the year, while the ever-growing list of triple-A titles added to Xbox Game Pass has meant that Xbox’s game streaming service has picked up a lot of traction throughout the year. The console’s strongest exclusive yet landed in October – when Playground Games’ Forza Horizon 4 launched. 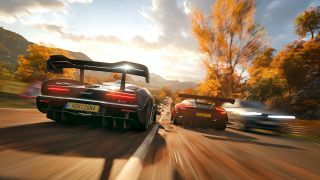 An immediate 10/10 was awarded by OXM for the best racer we’ve seen on any console – with its lush UK settings with seasonal changes, smooth racing gameplay and a broad range of vehicles helped it over the finish line in style. Later that month saw the release of Red Dead Redemption 2. While not an Xbox exclusive, technical analysis rated the Xbox One X as the best console to play it on, thanks to the fact that the Xbox One X plays Red Dead Redemption 2 in native 4K while running the game at an impressively consistent 30fps – quite something given the complexity and busy-ness of Rockstar’s epic open-world Western. Another hugely impressive milestone for Xbox was achieved when Microsoft’s [email protected] programme racked up 1,000 indie titles. The programme was set up to nurture creative talent by giving small independent developers a platform for their games, resulting in some of the most innovative and intriguing games on Xbox. Microsoft also unveiled Project xCloud, a ‘state of the art global game-streaming’ service coming soon, while also revealing a 95 percent year-on-year revenue growth of hardware sales, thanks to a huge uptake in sales of Xbox One S and X consoles, while Xbox Live users were up by four million to 57 million players worldwide. Not a bad end to the year for the US console giants. 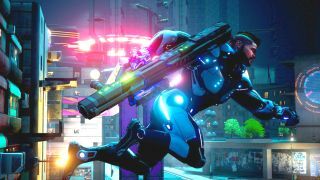 November brought the quite unexpected news that console exclusive Crackdown 3 – which was becoming something of a myth having been delayed time and again – was finally ready to be seen, and would release for the Xbox in February 2019. The game was one of a number of exciting announcements to come out of Microsoft’s XO18 celebration in Mexico City in November, which also announced more Game Pass games, a PvP update for Sea of Thieves and mouse and keyboard support for more Xbox console games. Bigger news still with the announcement that two more developers would be integrated into Microsoft Studios – RPG specialists InXile and Obsidian – boding well for more Xbox exclusives to come. Big Xbox winners at the Golden Joysticks included Forza Horizon 4 winning Xbox game of the year, with Fortnite and Red Dead Redemption 2 also cleaning up, while December’s Game Awards similarly dished out the trophies to Rockstar’s game. 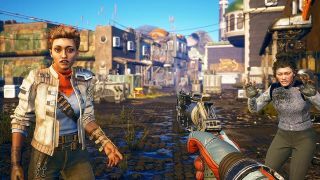 The Game Awards also saw a number of new game announcements including Mortal Kombat 11, Far Cry: New Dawn, Obsidian title The Outer Worlds and more all set to appear on Xbox in the coming year. With all this forward traction, we’re expecting even bigger things from Microsoft in 2019. With seven years generally the life-span of a console generation – and it’s almost been six for Xbox One – we’d certainly expect some firmer news of an Xbox Two by the time E3 comes around, and with it Halo Infinite… watch this space. Want to see what else you’ve got in store for next year? Here’s our pick of the best upcoming Xbox One games for 2019 and beyond.